Jared Connaughton was raised on Prince Edward Island, Canada's smallest province. He played hockey and soccer competitively for nearly a decade before he embarked on his mission to pursue the sport of track and field. That mission however, would not come without several, seemingly insurmountable obstacles, namely not having access to a synthetic track surface for training. Jared and his coaches, improvised and used a vocational college hallway and a retrofitted railroad track-turned-walking trail as his primary training locations. After only a few months of training, he became the nation's premier junior (u-19) 200m athlete. Those performances garnered attention from a multitude of NCAA D-1 institutions and he ultimately settled on the University of Texas-Arlington. Throughout Jared's four year eligibility, he went on to earn All- Southland Conference honors 15 times and 7 time SLC gold medalist, 3 time SLC High-Point Scorer, 2 time SLC Athlete of the Year honors and was captain of the 07' Conference Team Champions. He was also named to the NCAA Mid-West All-American Team 4 times. After his collegiate eligibility, Jared transitioned to the Canadian National Team and to the Professional ranks. He went on to win 11 medals at the Canadian championships over nine seasons, two of which were gold (08' & 10') and still holds the Canadian championship/Olympic trials 200m record of 20.34 seconds. -And most notably 2 time Olympian: 08' Beijing & 12' London, both of which he was a finalist as a part of the 4x100m relay. 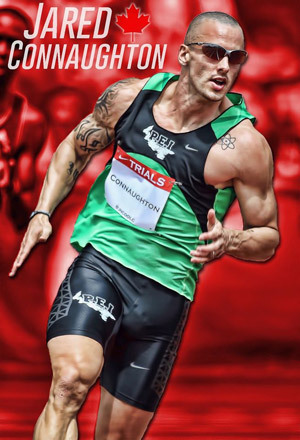 In September 2014, Jared announced his retirement from Track and Field and has now transitioned his passion for speed, athletic development and biomechanical prowess to the coaching ranks. Not only did Jared compete at the highest level within his sport, he was also named as a National Team captain on three occasions, most notably at the 2012 London Olympics. Resistance training and meal programming.